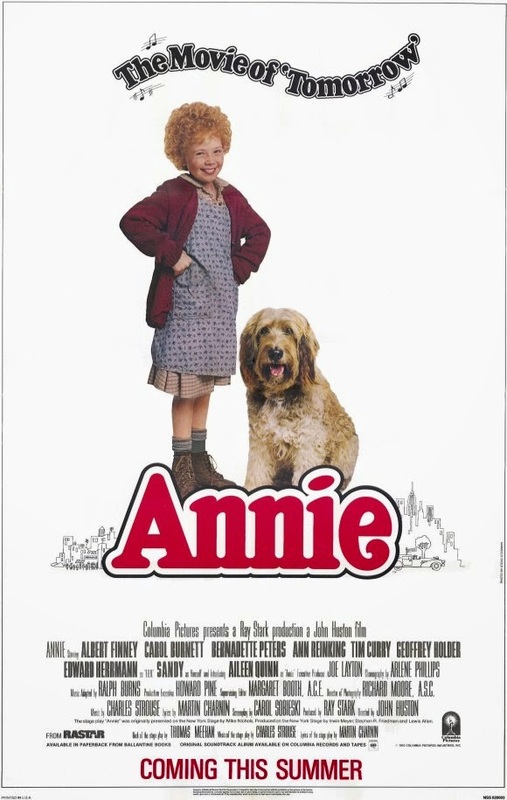 Annie (Aileen Quinn) is an orphan living at a home for girls run by the sinister Miss Hannigan (Carol Burnett). Despite living in a miserable situation, Annie always keeps high spirits and looks on the bright side of life. When Grace Farrell (Ann Reinking) is looking for an orphan to stay with her billionaire boss Oliver "Daddy" Warbucks (Albert Finney) for a week as a publicity stunt to improve his gruff image, she chooses Annie. Daddy Warbucks and Annie have a tumultuous start to their relationship, but eventually start to bond with one another. He even wants to adopt her, but Annie holds out hope that her parents, who gave her half of a locket when they dropped her at the orphanage, will return for her. Daddy Warbucks vows to help Annie find her parents, even if it means putting his own new found feelings aside. What's not to love about an adorable orphan girl with the cutest red hair you ever saw? A lot, apparently. This movie was adapted from the stage and brought to life by director John Huston, whose previous accolades include "Treasure of the Sierra Madre," "Key Largo," "The Maltese Falcon" and "The African Queen," some of the best films ever made. While this family film is not spectacular, it does have a bit of heart to it here and there. It also helps that most of the songs are ones that are either super catchy or ones that I was already familiar with since I was forced to sing them in choir. Though he was not the best singer, Albert Finney manages to be both likable and unlikable as a character. Daddy Warbucks is where we see the little bit of heart this movie contains as he eventually comes around to the idea of having a girl orphan instead of a boy one, subsequently leading he and Annie to sing a couple of cute, great songs together. His role is really the only one we connected to throughout the movie. Carol Burnett is fantastic as the wretched orphanage runner Miss Hannigan and she really brought some true nastiness to her character. Tim Curry and Bernadette Peters play a pair of con artists and though they aren't on screen a heck of a lot of time, what they manage to bring to the table is a couple of much needed perilous yet funny scenes. Many critics back in the day thought the choice to direct "Annie" was an odd one for John Huston, and now we can see why. Despite the heart it has going for it, there's just something about this movie that doesn't allow it to connect to us. All of the "heart" we mentioned above does seem rather baseline and expected. There's nothing that's overly unique about 'the feels' that this movie gives us. The movie as a whole is also marred by extremely slow pacing and there's really no way it needed to be over 2 hours long. On the same note, some of the musical numbers in the middle of the movie feel draggy and misplaced. While titular character Annie, played by Aileen Quinn, is a cute enough character, her singing, as well as the singing of the other orphan girls, isn't the best and feels sort of forced. There are also a ton of racist moments at Daddy Warbucks' mansion, mainly involving a character who is literally named Punjab. We're not overly sensitive people, but COME ON. He performs his 'magic levitation tricks' to an overtly stereotypical Indian instrumental song behind him! Their Asian limousine driver is also a martial arts master. All of these stereotypical moments distract from true point of the story and left us scratching our heads. We're not sure that another remake of this movie is warranted, but damned if we're not looking forward to it based on the trailer they have been running since January! One year ago, we were watching: "Out of the Furnace"